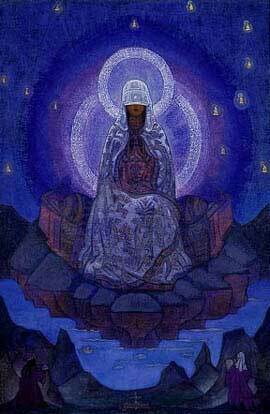 Mother of the World by Nicholas Roerich. 1924. Editor, Reverse Spins: These quotes were given to Nicholas and Helena Roerich by El Morya in the 20's and early 30's. 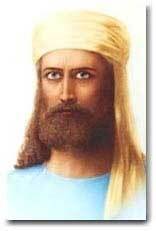 El Morya who ascended in the late 1800's, is one of the founders of Theosophy as well as Agni Yoga. He then went on to cofound The Bridge to Freedom and then the Summit Lighthouse with Saint Germain. 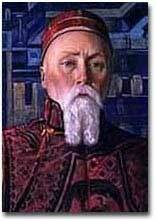 Nicholas Roerich, a Russian, spent many years in Tibet. He was truly a Renaissance man. His paintings are very original and have a special ethereal quality. He had a student in FDR's Cabinet. The book Leaves of Morya's Garden by Roerich was even on Elvis Presley's reading list. El Morya has written and dictated on almost every subject imaginable over the yearsalways with the goal of elevating mankind and bringing in a New Era. Here are his thoughts on woman, mothers, the Divine Feminine and the Mother of the World. The manifestation of the Mother of the World will create the unity of women. The task now is to create a spiritually sovereign position for the woman. And the transmission to woman of direct communication with the Highest Forces is necessary as a psychological impetus. Of course, through the new religion will come the necessary respect. Leaves of Morya's Garden - Book 2 - Illumination (1925) - 2.4.9. Urusvati. It is time to say that this is the name we have given to the star which is irresistibly approaching the Earth. Since long ago it has been the symbol of the Mother of the World, and the Epoch of the Mother of the World must begin at the time of Her star's unprecedented approach to the Earth. The Great Epoch is beginning, because the spirit understanding is linked with the Mother of the World. Even to those who know the date it is marvelous to behold the physical approach of the predestined. The approach of this very great Epoch is important; it will substantially change the life of the Earth. A Great Epoch! I rejoice so much, seeing how the new rays are piercing the thickness of the Earth. Even though in the beginning they are hard to bear, yet their emanation induces new elements, so needed for the impetus. New rays are reaching the Earth for the first time since its formation. Leaves of Morya's Garden - Book 2 - Illumination (1925) - 2.4.11. The Mother of the World appears as a symbol of the feminine Origin in the new epoch, and the masculine Origin voluntarily returns the treasure of the World to the feminine Origin. Amazons were the embodiment of the strength of the feminine Principle, and now it is necessary to show the aspect of spiritual perfection of woman. Leaves of Morya's Garden - Book 2 - Illumination (1925) - 2.5.2. The Star of the Morning is the sign of the Great Epoch which will flash as the first ray from the Teaching of Christ. For who is to extol the Mother of the World if not Christ, the One so demeaned by the world. Leaves of Morya's Garden - Book 2 - Illumination (1925) - 2.5.5. I have already told you that the Mother of the World conceals Her Name. I have already shown you how the Mother of the World veils Her Face. I have already made mention about the Mother of Buddha and Christ. From times immemorial the Mother of the World has sent forth to achievement. In the history of humanity, Her Hand traces an unbreakable thread. On Sinai Her Voice rang out. She assumed the image of Kali. She was at the basis of the cult of Isis and Ishtar. After Atlantis, when a blow was inflicted upon the cult of the spirit, the Mother of the World began to weave a new thread, which will now begin to radiate. After Atlantis the Mother of the World veiled Her Face and forbade the pronouncement of Her Name until the hour of the constellations should strike. She has manifested Herself only partly; never has She manifested Herself on a planetary scale. Leaves of Morya's Garden - Book 2 - Illumination (1925) - 2.8.11. Now, more about the Mother of the World. The Mother is Beauty; the world is self-sacrifice. Precisely by these two fundamentals are the Gates opened. Leaves of Morya's Garden - Book 2 - Illumination (1925) - 2.8.12. The unprecedented deviations of planets help the awakening of consciousness. The Space is becoming dense, and the ray of Mars will be drowned in the light of the Mother of the World. Leaves of Morya's Garden - Book 2 - Illumination (1925) - 2.8.13. The spheres of the elements are of dazzling beauty, and besmirching them is like destroying a wonderful flower. I feel that the teaching of pure thoughts will penetrate into people's consciousness. The sower of thought gathers the harvest. Therefore, with the Mother of the World all-seeing cooperation is unavoidable. The state of the substance of the space, pierced by the combinations of new rays, permits the beginning of the New Era. All Good should be gathered. Leaves of Morya's Garden - Book 2 - Illumination (1925) - 2.9.7. Let the things of everyday life vanish, but let the country of the future be embodied in thought. And what cleanses the spirit more thoroughly than the thoughts about the welfare of others? And what tempers the armor of steadfastness better than the wish to lead others to Light? And what weaves a better smile than a desire to see the very last child laughing? I urge you to think thus about the future, to place daily a pearl into the necklace of the Mother of the World.. And so, concisely and simply think how to adorn the Hearth of the World. Leaves of Morya's Garden - Book 2 - Illumination (1925) - 3.3.10. In Our Hindu writings you have encountered the expression "play" applied to cosmic concepts. The play of the Great Mother of the World - is it not visible to the illumined consciousness? And the drama of blood - is it not changed in the light of radiant matter. Yet for the radiant play it is necessary to have a prepared hour. New Era Community (1926) - 216. The old world rejected the Mother of the World, but the New World begins to perceive Her lustrous veil. Agni Yoga (1929) - 55. Have you finally learned to rejoice at obstacles? Can We be assured that what seems like an obstacle will multiply your resourcefulness tenfold? Can We accept you as conquering warriors? Can We send you the arrow of help, assured that you will catch it in flight? Can We pronounce the word of the New World in unison with you? Can We believe that for the sake of the beauty of creation you have burned your outworn garments? Can the Mother of the World entrust to your vigilance the texture of Light? Can the Lion hasten to your aid? Can the Light illumine your path? And finally, do you understand how to apply to yourself the given Teaching? Can We entrust to you the wearing of the given signs? Can We dispatch the ray of perfectment? Can We vouch for your vigilance? Can We construct a stronghold from your understanding of self? Can We rejoice at the steadfastness of your path? Can the Mother of the World call you just? Can the Lion become the protector of your dwelling? Can the Light bathe the new steps? Unbolt your doors! Victory is at the threshold! Agni Yoga (1929) - 72. The Breath of the Mother of the World, the Giants bearing the burden, and the Redeemers who have accepted the Chalice - these three images were born close to the one law. The accumulation of spatial psychic energy causes shocks in parts of the planet. Those organisms that are attuned to the Breath of the Great Mother resound in response to the explosions of spatial bodies. Can such shocks be regarded as an advantage? It is precisely as when, for the performance of a superb musical creation, one chooses perfectly tuned instruments. Of course, when such instruments are few, the pressure of the currents will fall upon just those few. It is not necessary to prove that it is better to accept the burden of the world than to be detached from the activities of life. Agni Yoga (1929) - 306. Every structure has its outer walls and its unseen foundation. No structure can exist without walls, and walls cannot stand without a foundation. There are two ways of manifestation in everything: one is the walls, as a symbol of the Teacher, and the other is the foundation, as the manifestation of the Mother of the World. Which is of greater importance? Ponder! The walls and the pilings of the foundation are equally necessary for any building. But, just as a foundation is not seen from afar, so does the image of the Mother of the World remain invisible. It is the walls that withstand the assaults of the gale. In the same way, because Our Name is known to multitudes, We must take upon Ourselves the assaults of the hostile currents. Agni Yoga (1929) - 326 &327. The Teaching, based on experience, brings to each thinker the joy of application. Do not limit that which is immeasurably great and close to the active consciousness. Do not constrict within preset limits that which comes down to us as the Breath of the Mother of the World. Let us say how joyful it is to serve the cause of renewal without fear of taking the wrong path. Beginning with the most obvious and tangible, following the immutable laws, let us apply our best efforts to the Teaching of Life. Agni Yoga (1929) - 407. I say that you must learn to affirm the Origin in the beauty of Cosmos by permeating life with the hymns of the Mother of the World. Agni Yoga (1929) - 623. Eternally moving, eternally striving, eternally aspiring to the heights, eternally manifesting vigilance, affirming Truth, manifesting the radiant thread of the Mother of the World by the armor of infinite beauty, assailing the darkness of ignorance, promising to the abode of humanity the glory of the stars - thus walk, saying, "World, I wish to accept all thy gifts; I wish to fill to the brim the chalice of attainment; I wish, O Lord, to drain the chalice of the Wisdom of Thy Covenants!" Infinity - Book 1 (1930) - 7. Why does there exist in the world the custom of worshipping the cosmic powers in the moment of distress? Why only then the attraction toward Infinity? Why just then the recognition of the so-called supernatural forces? I advise that the Name of the Mother of the World be pronounced not as a symbol but as a power-giver. I advise that the Source of Infinity be invoked not as a symbol but as a manifestation of Eternity, as an eternal Generator of beauty and the Creator of the firmament. Infinity - Book 1 (1930) - 9. The cosmic Breath of the Mother of the World is all-pervading. Verily, all is imbued with it. From infinitesimal grains of dust to immeasurable magnitudes, life moves and breathes by this Breath. How then not to cognize the power which moves the Universe! How not to ponder upon the essence of Being! Fathom the rhythm of cosmic energy and understand the rhythm of evolution. The essence of evolution is unalterable and is measured by the manifestation of Infinity. Infinity - Book 1 (1930) - 10. You who fear the end, turn your face to the radiance of the Mother of the World and affirm yourself in the understanding of evolution. There is no limit to the sendings from the Mountains. There is no limit to the warranty of the far-off worlds. There is no limit to the natural treasures of the visible and invisible spheres. Infinity - Book 1 (1930) - 10. Thou, spirit, striving to the Creator of Cosmos, turn to the Mother of the World. Proclaim what thou seest. Space is revealed as manifesting the utmost creativeness. The immensity of Space and the inalienability of the cosmic forces enrich the kernel of our being. The levers of evolution are the finest energies which may become the possession of men. Infinity - Book 1 (1930) - 22. The word materialism has assumed a monstrous significance. And yet, materialism should be based upon the all-pervading substance of the power of the Infinite. Why this perversion of cosmic power? The symbol of the Mother of the World, giving form and purpose to the entire Breath of Cosmos, transforming the kernel into incalculable manifestations, crowns our Earth with beauty. Infinity - Book 1 (1930) - 38. The Mother of the World is the great creative force in our being. Infinity - Book 1 (1930) - 38. The Mother of the World lives and constructs. And We proclaim not the utopia envisioned by humanity but a true striving toward endless construction. Infinity - Book 1 (1930) - 47. When I say that the cosmic incessancy affirms also our karma, it means that I wish to free human consciousness from delusion and to instill in the human spirit the thread of understanding which leads to incessancy. I affirm that a clear understanding will point out the incessancy of all our actions. The Cosmic Fire is incessant and inexhaustible. One must understand that the Infinite is an aggregate of life processes. Cause and effect, thought and action, are the karmic predestinators of the life principle. Whither can the unbroken chain deviate? An unbroken path is open to the spirit; it reveals the symbol of the Mother of the World to him who has chosen the symbol of Light. But the erring one who seeks darkness will not touch the Fire of Space. Infinity - Book 1 (1930) - 68. The attainment of the inner Fire, the degree reached by the Mother of Agni Yoga, is the rarest achievement. This degree of Fire is called the degree of attained Arhat. This living Fire was known in antiquity. The alchemist knew about it. The attainment of this higher degree of powerful flame may be manifested only by that spirit who lives the psycho-life of the whole heart. The mightiest lever of Cosmos, and the most sacred, is the heart. Its consciousness fills Space; its light illumines Cosmos. Infinity - Book 1 (1930) - 79a. Life is comprised of an eternal succession of ideas and of manifestations of cosmic energies. How can a spirit who does not project his thought into the realm of ideas adopt the concept of Infinity! When thought will take on the significance of something vital and realizable, it will reveal to man where is joy and where is truth. The quests of thought have led to unification with the Fire of Space. The quests of thought have led to the acceptance of the records of the past. The quests of thought will lead to the realization of higher worlds. The quests of thought will lead to the irradiance of the Mother of the World. Striving will lead to boundless beauty! Infinity - Book 1 (1930) - 96. In the chain of spirit creation we find manifestations of the most precise and subtle harmonies, manifested by the creativeness of Cosmic Fire. The Cosmic Fire is not solely the substance from which we derive our forms. All the subtlest spiritual manifestations, which affirm the most worthy human actions, We call Fire. Beauty of achievement lies at the basis of spirit-creativeness. Our Mother of the World has endowed the world with that eternal achievement which is laid into the foundation of the Universe. Why does Earth dissipate so much its treasures? The origin of self-sacrificing achievement is the foundation of all pure beginnings. The self-sacrificing achievement of the Mother of the World is reflected in spirit-creativeness as the refulgence of Cosmos. Let us accept as law the manifested sacred achievement. The beauty of life is contained in cosmic unity, and the principle of life is based upon the affirmation of an achievement. The self-sacrifice in the achievement links the spirit with the highest manifestations of Be-ness. Fullness of life may be expressed by the spirit who carries the chalice of self-sacrifice on his way toward Infinity. Infinity - Book 1 (1930) - 117. Urusvati is right - a wondrous truth is in beauty. Cosmos affirms evolution by this formula. Cosmos directs the world to the mastery of beauty. Yes, verily, the Mother of the World possesses the Magnet of Beauty. And wherever the Spatial fire has collected the fiery affirmation of its forms, the fire of the spirit manifests itself. When the invisible process is revealed to the fiery spirit, it may then be said that the creative transmutation has been confirmed. Therefore, one may say that the psycho-dynamics of the spirit transmutes as a most saturated fire. When the centers can flamingly reflect the will of the Cosmic Magnet, then the psycho-dynamics of the spirit unites the higher planes with the planet. Infinity - Book 1 (1930) - 178. When one can manifest the creativeness of the spirit which is directed toward the radiance of the Mother of the World, then truly reflected is the world of highest tensions. And the analogy leads to eternal striving into the spheres manifested by the Cosmic Magnet. Infinity - Book 1 (1930) - 180. Humanity has so greatly violated the Magnet of Be-ness that the construction of new life must be established. Only thus can be stopped the generation of currents which now so completely engulf humanity. We, Brothers of Humanity, battle for the Cosmic Magnet and for the life principle. The time is complex, but great! In tension, amidst humanity's monstrous non-comprehension of the principle of Be-ness, We give a new Covenant. We summon humanity to that Covenant. In the great Covenant lies the principle of Be-ness. We say to humanity, "Venerate the Origins; venerate the Mother of the World, venerate the awesome Covenant of the Cosmic Magnet!" Yes, yes, yes! Thus speaks Maitreya! Infinity - Book 1 (1930) - 227. For some, Shambhala is the Truth. For others, Shambhala is a utopia. For some the Ruler of Shambhala is a venerable sage. For others, the Ruler of Shambhala is the manifestation of riches. For some, the Ruler of Shambhala is a bedecked idol. For others, the Ruler of Shambhala is the Ruler of all Planetary Spirits. But We shall say, The Ruler of Shambhala is the fiery Impeller of Life and of the Fire of the Mother of the World. His Breath is ablaze with flame and His Heart is aglow with the fire of the Silvery Lotus. Hierarchy (1931) - 5. To the Brothers of Humanity is assigned the construction of the life of the planet; and they maintain the Command of the great Mother of the World. The music of the spheres resounds when the current of joy is in motion. The music of the spheres fills space when the heart is stirred to tremor by the cosmic force. The Heart of Our Brotherhood safeguards for humanity the path to the General Good. Hierarchy (1931) - 11. Each Lord has his keynote. The Epoch of Maitreya proclaims woman. The manifestation of Maitreya is linked with the confirmation of the Mother of the World, in the past, present, and future. The "Book of Life" is so beautiful. Hierarchy (1931) - 13. It is authentically known that some aromas evoke a tension of psychic energy on the surface of the skin at the origins of the nerves. Certain species of roses and the ingredients known to you as the balm of the Mother of the World are useful for this. The benign action of the balm itself is greatly augmented by the invoked psychic energy. Therefore, various forms of skin disease and disintegration of matter are subject to this action. Of course, when clarity of consciousness is added, the result is increased still more. Therefore, proper suggestion is useful even with the best remedies. Let us not forget that these indications are useful for the investigation of psychic energy. Heart (1932) - 137. How can one attain success? Remember, through joy - not through despair, but joy. Do not for an instant believe that We ponder the probability or improbability of success. The thought is, Does your joy suffice to quicken the ascent? We always counsel joy. It is necessary to realize and remember that you have succeeded when you rejoiced. Certainly this is not the frisking of a calf on the meadow, but the creative joy which transforms all difficulties. The play of the Mother of the World is in joy. She enfolds the enlightened ones in Her veil of joy. Rejoice amidst flowers; and in the midst of snow - equally redolent - also rejoice! Fiery World - Book 1 (1933) - 663. The Lights of the Mother of the World resemble the pillars of the Aurora Borealis. Very rare is the phenomenon when the microcosm - man - can be compared to the Macrocosm. Ur. has seen such a manifestation. It responds to the pressure of world energy. Fiery World - Book 2 (1934) - 424. The planetary dates correspond with all the supermundane dates. The dark condition of this planet requires all forces for the affirmation of equilibrium. It is easy to think about the future when the spirit knows the bond of the two Worlds, when the spirit can be successful in its strivings toward the Fiery World. There cannot be an intensification which does not reveal to the spirit the amplitude of the manifest future. In the Subtle World events go on which assist manifestations on the Earth. Especially tensed are the strata which are close to the Earth. Entire armies are being assembled for events. Entire nations are being armed against the forces of destruction. The Supermundane World will not leave the planet helpless. So too, the Mother of the World and the Hierarchy of Good and the Fiery Viceroys are mobilizing their camps. Verily, great is the time solving the earthly destiny - the Heavenly forces saturate the space. Thus let us remember on the path to the Fiery World. Fiery World - Book 3 (1935) - 89. Generally, man's centers are understood relatively. Their very names have changed, in different languages, over millenniums. Some call the Chalice "the celestial axis," but this does not change its significance. Others may speak about the influence of the Mother of the World, even though in its essence Shakti contains the great meaning of the Primary Energy. Also, people forget about the collective action of the centers, which is quite different for each one. Equally individual is the transmutation of the centers in the subtle and fiery bodies. They preserve their essence in each body, but their development depends upon the progress made in passing through earthly life. Supermundane - The Inner Life - Book 1 (1938) - 48. It is truly told about the power of love for humanity. Can one love a garden and despise its flowers? Can one worship the power of beauty and not show respect for love? I attest that the Power adorning Our Universe is confirmed as Our Mother of the World - the Feminine Origin! Indeed, one may cite many scientific examples indicative of the creative destiny of woman. Those who deny the evidence of woman's creativeness should reflect that woman gives voluntarily. It does not mean that those who possess the rights are the ones who affirm them. Hence is the woman's path termed one of voluntary giving. Certainly in Cosmos everything is interwoven, but humanity transgresses the laws of the Higher Reason. Truly, the Feminine Origin is most beautiful! Verily, the pinnacle of Be-ness cannot exist without the Feminine Origin. How badly people have mutilated the great cosmic laws! How far people have departed from Truth! Infinity - Book 1 (1930) - 156. It is very difficult to determine the boundaries in Cosmos between the so-called passive and the active. If We say that all forces are active, men will find this declaration a paradox. But a higher consciousness can understand how We perceive all forces of the Origins as active. The differentiation is so bereft of subtlety that it is difficult to convey to people about the principle which dwells in the manifested power of Mulaprakriti. Likewise, the principle of life cannot be asserted without the realization of the Feminine Origin. Like the Cosmos, Mulaprakriti is a universal principle. The origins cannot be regarded as competitive forces; only unification of the forces creates life. And We, in the higher worlds, manifest a consecrated reverence for the Origin which humanity calls passive. Yes, yes, yes! The higher consciousness knows the Truth and We are ready to proclaim this Truth to humanity; but for this, humanity must ascend the higher step. Yes, yes, yes! When each Lord had to be given to the world by a mother, how may one not revere Thee, Mother of the World! When each Spatial Fire has to be made manifest in a form, how may one not revere Her who gives life! yes, yes, yes! How then may one not accept as the highest manifestation of the Cosmos the power in the intense symbol of the Mother! Infinity - Book 1 (1930) - 201. Today is the beginning of the feminine awakening. A new wave has reached Earth today, and new hearths have become alight; for the substance of the rays penetrates deeply. Leaves of Morya's Garden - Book 2 - Illumination (1925) - 2.4.11. Also, why are women often awakened to the Subtle World? Because the work of the heart is most subtle, and thus transcendentalism appears easier for them. Verily, the Era of the Mother of the World is based upon realization of the heart. It is precisely woman alone who can solve the problem of the two worlds. Thus, one can summon woman to understanding through the heart. That will also be useful, primarily because the quality of the heart is eternal. Already there are many heroic deeds among women, but now instead of the stake woman has been accorded the flame of the heart. Let us not forget that for each important achievement the Feminine Principle is essential as a foundation and essence. The heart cannot open to the Subtle World if it is not understood through a special achievement. Heart (1932) - 106. Indeed, if humanity would not violate the manifestation of the First Causes, the foundations of Existence would retain that basis which manifests the beauty of life. Cosmic Right brings understanding of the fact that a one-sided administration of the planet is plunging it into an abyss. Cosmic right offers to humanity that Principle which can pierce the darkness. Cosmic right reveals to the planet the unity of Principles which guides the entire Universe. Cosmic right reveals the Feminine Principle as a manifested power. Cosmic Right reveals the greatness of the Feminine Principle, which manifests self-renunciation, and before which verily the great Arhats bow themselves. Verily, We reverence the great Feminine Principle. Verily, We reverence the giving Principle which bestows the life of Beauty and of the Heart. Fiery World - Book 3 (1935) - 194. Hence it is so indispensable to affirm in the spirit the Feminine Principle. For the Banner of the great Equilibrium of the World has been given to woman to uplift. Thus the time has come when woman must fight for the right that was taken away from her and that she did voluntarily give up. How many powerful records fill space with the attainments of the Feminine Principle! As the Teacher creates through the disciples, so does woman create through the masculine principle. Therefore woman flamingly uplifts man. Hence also degeneration, because without true knighthood the spirit cannot rise. Fiery World - Book 3 (1935) - 241. So, too, does creativeness proceed according to the spiral, and each vital attraction or repulsion creates its own spiral. That is also why spirals of the Masculine and Feminine Principles proceed in such divergent directions. The Masculine Principle strives for seizure, regardless of the heart of man. The Masculine Principle makes bridges for its achievements by stepping upon hearts and heads. The issue is not brain power, for potentially the Feminine Principle contains the same fires. But the Feminine Principle is in need of freedom for heart expression. When it becomes customary to allow the Feminine Principle to live and develop its potentiality toward regeneration through its feeling of continuous giving, then will the Feminine Principle outdistance the Masculine in all directions. Fiery World - Book 3 (1935) - 284. When we speak about Spirit and Matter, we should have in mind the higher meaning of Matter. But speaking about the liberation of Spirit, we refer to those manifestations which can be called material life units. It must be known that in speaking about these unifications under various forms a downfall of the spirit is understood. For the spirit, being made manifest in matter, must aspire to the higher functions together with matter. Matter is impelled to creativeness which gives rise to forms of life. And the spirit must know specifically how sacred is the sojourn in matter. The cosmic concept of the Feminine Principle as Matter is so lofty - the Truth is so far above the worldly understanding! Only a pure and elevated consciousness can appreciate this comparison. It is difficult to dissociate Spirit from Matter. Fiery World - Book 3 (1935) - 304. In the future reconstruction of the World, on the higher spheres there will not be access for those who do not understand equilibrium. Long incarnations will be necessary, to study how to create cosmic equilibrium. Indeed, empires have fallen, nations have fallen, countries have been destroyed, all because the great question, that of equilibrium, has been reduced to nothing. Therefore it is so important to affirm the significance of the feminine principle. Precisely, not in the household measuring scale, but in that of the state. If the planet is retained, then future countries will flourish only through equilibrium. We will even admit a preponderance on the side of the feminine principle, because the conflict will be very intense. Indeed, Councils of Ministers will have to include women. Woman, who gives life to a people, must also have a voice in the making of its destiny. Woman must have the right of voice. If woman were accepted as was ordained, the World would be quite differently impregnated. Thus, only affirmation of the law of Existence can restore the order of man. Fiery World - Book 3 (1935) - 347. An Arhat sometimes waits for centuries to give a sacred mission. The manifestation of certain missions demands special combinations. We Arhats follow the principle of goal-fitness. The experiment of the Mother of Agni Yoga is distinguished not by brilliancy but by cosmic scope. Infinity - Book 1 (1930) - 106. A great number of manifestations can be named wherein precisely woman can lend a special tension of psychic energy. But due attention has not been paid to such special qualities of women. It is rarely understood among physicians why the participation of a woman in operations can be particularly useful. The eternal Feminine Principle has not yet found its just interpretation. AUM (1936) - 428. To all these insanities will be added the most shameful - the intensified competition between male and female. We insist upon equal and full rights for women, but the servants of darkness will expel them from many fields of activity, even where they bring the most benefit. We have spoken about the many maladies in the world, but the renewed struggle between the male and female principles will be the most tragic. It is hard to imagine how disastrous this will be, for it is a struggle against evolution itself! What a high price humanity pays for every such opposition to evolution! In these convulsions the young generations are corrupted. Supermundane - The Inner Life - Book 2 (1938) - 286. Striving toward development of consciousness depends upon the impulse of the seed of the spirit. The cumulation of striving intensifies the growth of consciousness. If the energy lacks striving, the manifestation of the intensity of energy is considerably weakened, and the attraction cannot result in fusion. Thus, the seed of the spirit is in need of striving. The best sign of the tension in the seed of the spirit is the intensified fire; hence, the centers of the Mother of Agni Yoga are so aflame and the tensity of fire is so great. Only the influx of fire bears witness to this fire; and creativeness of the centers is very flaming. Infinity - Book 1 (1930) - 343. Indeed it is time to point out that the one Mother of both Lords is not a symbol but a Great Manifestation of the Feminine Origin, in which is revealed the spiritual Mother of Christ and Buddha. Leaves of Morya's Garden - Book 2 - Illumination (1925) - 2.8.11. It is necessary to guide the education of a people from the initial instruction of children, from as early an age as possible. The earlier, the better. You may be sure that overfatigue of the brain occurs only from awkwardness. The mother approaching the cradle of her child utters the first formula of instruction "You can do everything." Prohibitions are not needed; even the harmful should not be prohibited. It is better instead to turn the attention simply to the more useful and the more attractive. That tutorage will be best which can enhance the attractiveness of the good. Besides, it is not necessary to mutilate beautiful Images for the sake of an imagined childish non-understanding; do not humiliate the children. Firmly remember that true science is always appealing, brief, precise and beautiful. It is necessary that families possess at least an embryo of understanding of education. After the age of seven years much has been already lost. Usually after the age of three years the organism is full of receptivity. During the first step the hand of the guide must already turn the attention to, and indicate, the far-off worlds. Infinity must be sensed by the young eye. Precisely, the eye must become accustomed to admitting Infinity. New Era Community (1926) - 102. The mother can lay the first foundations for the investigation of psychic energy; even up to birth of the child, the mother will take note of the whole routine of life and of feeding. The character of the future man is already defined in the mother's womb. Certain peculiarities that predetermine character can already be observed in the desires expressed by the mother herself. However, in this case it is necessary to make honest observations. But the capacity of observation itself needs to be cultivated. AUM (1936) - 552. We would not be distorting the truth if We said that the human essence is formed in the Subtle World. All family and earthly influences are but external and supplementary, since the seed of one's nature has already been acquired during the subtle sojourn. Fortunately, a mother can sense this essence, sometimes even before birth, and begin to work zealously and sensitively to prepare the child for its earthly life. Supermundane - The Inner Life - Book 2 (1938) - 425.